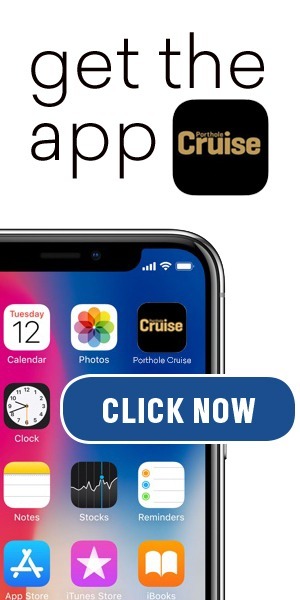 Do you like to cruise but not with the masses? Do you enjoy good food and great conversation? Are you looking to travel differently this year? 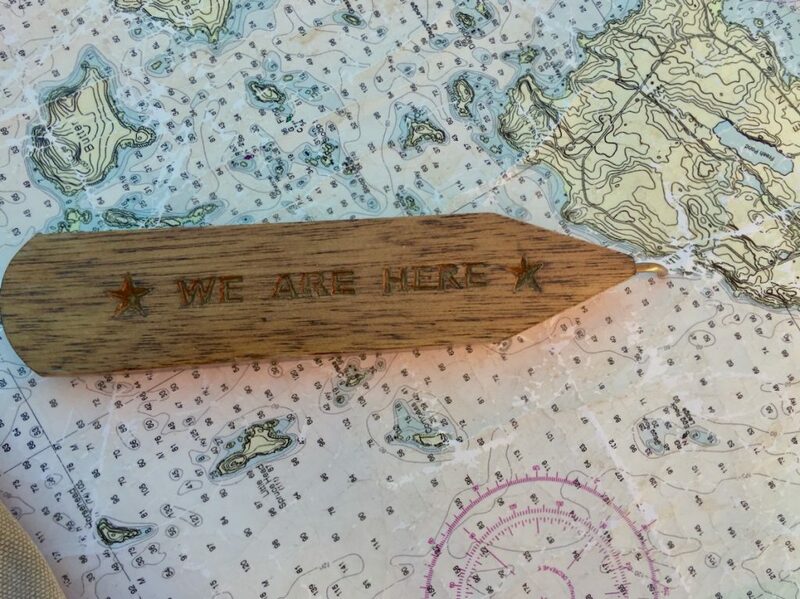 If you answered yes, you should consider a Windjammer Cruise off the coast of Maine for your next vacation. 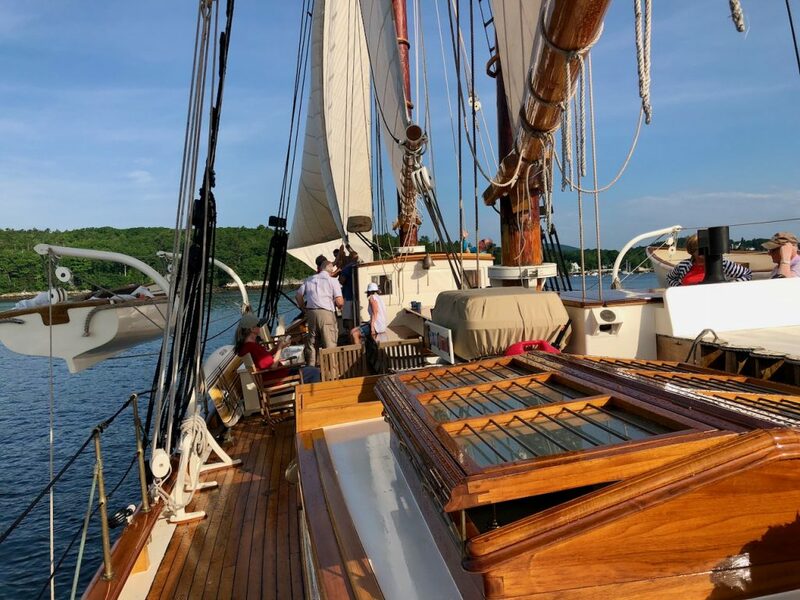 Sailing on a historic tall ship is an extraordinary cruising experience unlike any other. The Maine Windjammer Association has a fleet of eight ships each with their own personality. They offer three to ten-day cruises that leave from either the ports of Rockland or Camden. 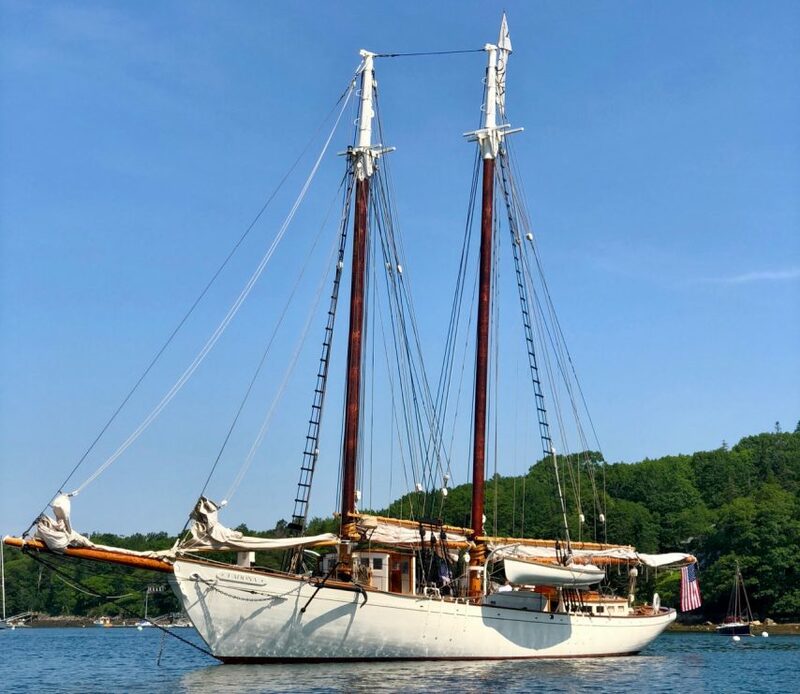 These sailings showcase spectacular seaside scenery, wonderful food, and time to explore quaint fishing villages and islands found along the rugged coast of Maine. There are themed cruises like wellness, photography, wine tastings or music. There is something for everyone. While you shouldn’t expect five-star luxury accommodations and amenities on a windjammer cruise it doesn’t mean you’ll be roughing it. If you prefer the finer things in life I’d recommend the Schooner Ladona. It is an authentically rebuilt 82-foot racing yacht. Sailing on this elegant ship is akin to glamping on a boat. 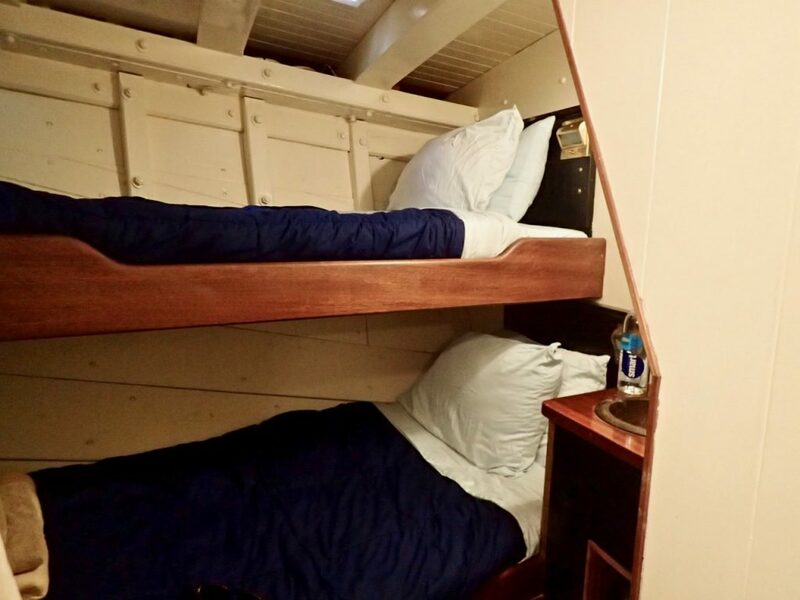 Schooner cabins are designed to be functional, yet comfortable. Unlike staterooms on a larger cruise ship, you will these quite cozy. They are outfitted with premium linens, bathrobes, bedside reading lamps, and a 110v outlet. The Ladona cabins even have two USB ports. Each room also has a small sink with hot and cold running water. What sets the Ladona apart from other schooners in the Maine Windjammer fleet are the bathrooms. 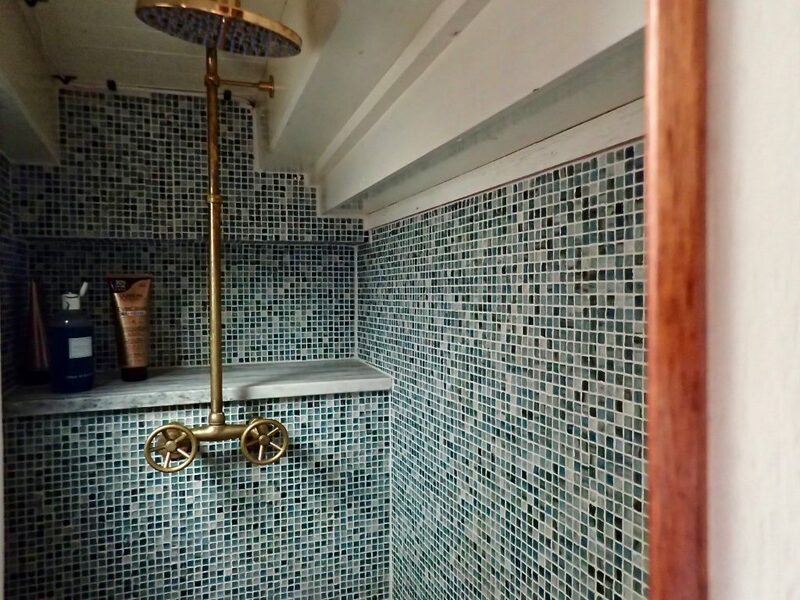 Guests share three heads, two of which have beautifully enclosed tiled showers accented with Carrara marble and bronze fixtures. Even though they are tiny in size, they that on par with what you might find in a hotel. You should know that cabins are usually reserved on a first-come, first-served basis. 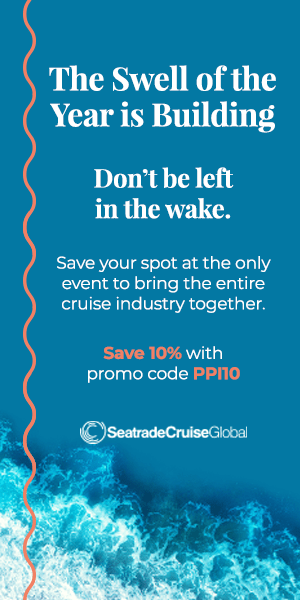 If you want first dibs on cabin choice, and to save a little money, check out the ship’s early bird pricing. Most times they also offer a discount for repeat guests. With no formal itinerary in place, each day on board is a new adventure. Rather than following a scheduled itinerary of ports to visit, the Captain choose which direction to go based on the winds and the tide. Unlike traditional cruising you’ll sail all day and drop anchor for the night in a secluded cove. With no agenda and no pressure, you’ll find there is plenty of time to put your feet up, rest, and really unwind. Depending on the day, you may also have the opportunity to explore a small coastal town or island hiking path. If the water is warm enough, the Captain will let you jump off the rail into the water for a swim or paddle board right off the side of the boat. 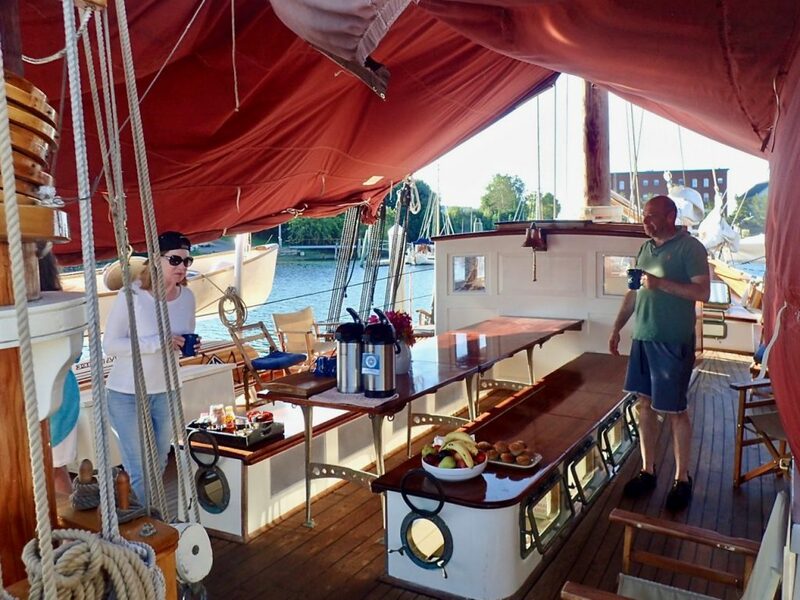 One of the unique aspects of cruising on a windjammer is the opportunity to actually helping to sail the ship. If you are so inclined the crew will always welcome assist in hoisting the sails. On the Ladona, Captain J.R. is gracious with his boat and often allows guests to stand at the helm and play captain for a while. The meals you will eat onboard are a culinary dream. The day begins with coffee, fresh fruit and muffins on deck. You are welcome to join Chef Anna in the in the galley kitchen below when you are ready for breakfast. She is up long before the sun comes up getting the wood stove started, baking fresh bread and prepare the meals for the day. While piping hot coffee brews in 1930s drip bubble pots, she’ll make made-to-order eggs, omelets or pancakes along with offering a daily specialty dish like french toast with caramel apple sauce. Lunch include a selection of salads, fresh-baked bread, hearty chowders, sandwiches and more. All meals are served family-style up on the deck. 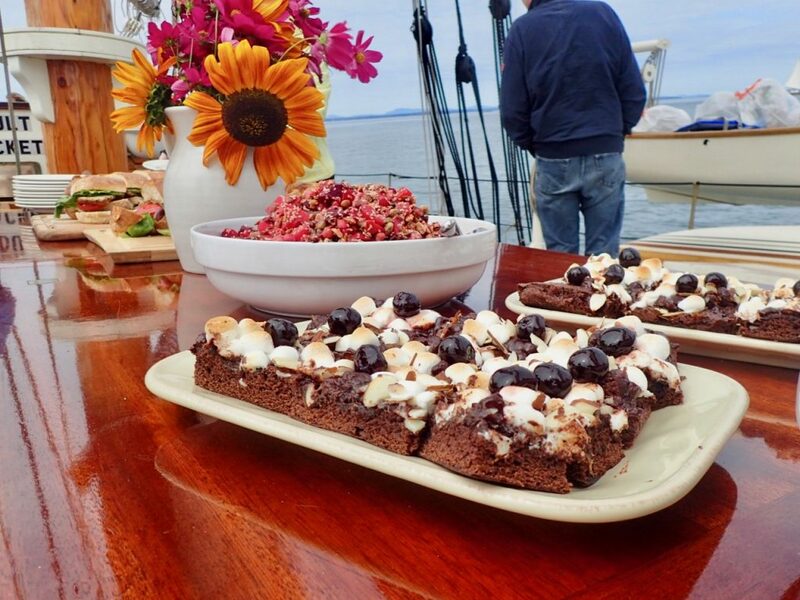 After you are moored for the evening, cocktail hour begins and leads right into dinner which is always an epicurean feast complete with a gourmet dessert. 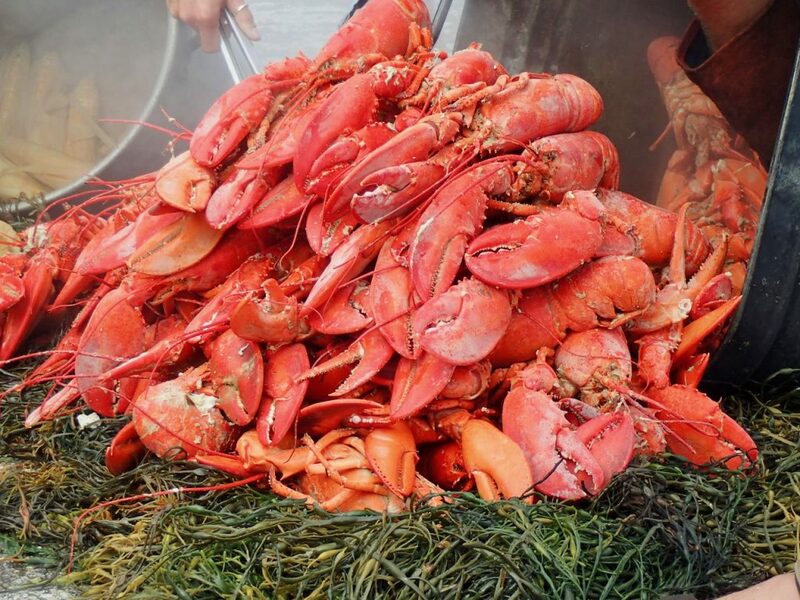 The highlight of any Maine windjammer cruise is an authentic lobster bake! One evening on the shores of a secluded island the crew will treat you to a feast of the freshest lobster dipped in melted butter alongside roasted potatoes and hot corn on the cob. The lobsters are steamed to perfection in seaweed over an open fire and served right up on the beach. The camaraderie you’ll enjoy among fellow passengers and the crew is not something found on larger cruise ships. With only sixteen passengers on the Ladona you will have the opportunity to meet like-minded travelers and perhaps form friendships that will last long after you have disembarked. The kinship you feel with everyone on board in just the short span of a few days is remarkable. 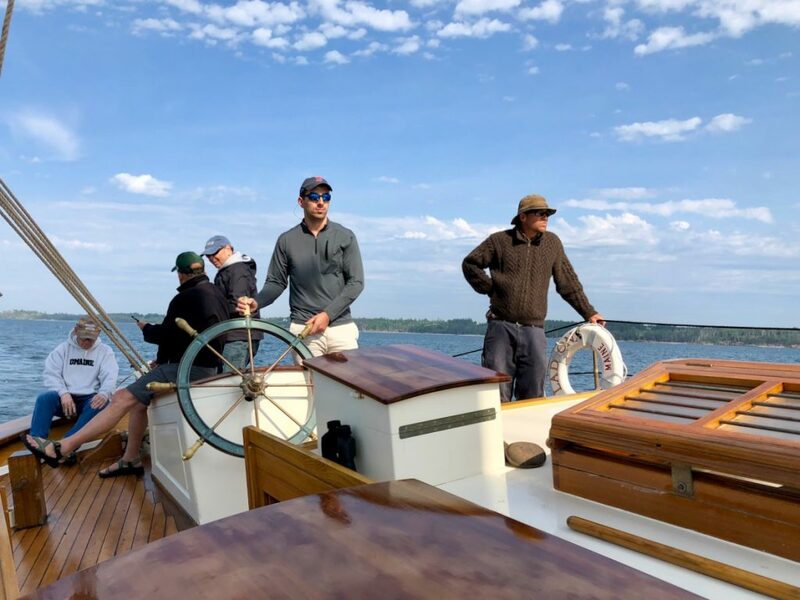 This comes from shared experiences like encouraging each other to jump of the stern into the cold Maine waters and then reaching out a hand to help them back on board. Or the fact that there is no wi-fi, no TV, and barely any cell service. Without the opportunity to check your devices all the time, you will be more likely to notice what is right in front of you. 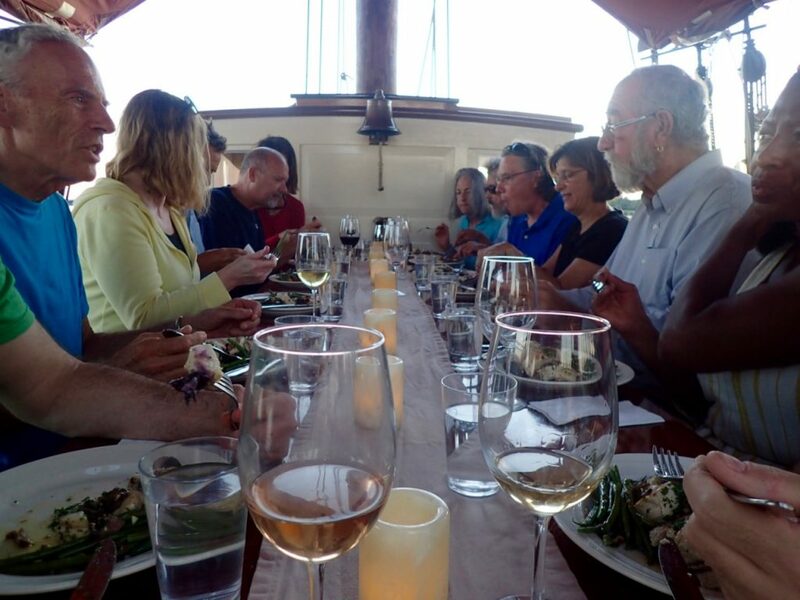 Don’t be surprised to find yourself sitting around the communal table, lingering long into the night listening to your shipmates regaling tales and telling stories from their past. A windjammer cruise is unlike any other vacation. I can’t think of a better type of vacation for those who want to escape from it all. Dana is originally from New York City but has been calling Vermont home for the last 20 years. She a freelance journalist and the editor behind Dana Freeman Travels. Through her writing, she provides unique destination information, reviews, and travel tips. Dana specializes in cruise, adventure, food, luxury, and multi-generational travel. You won’t find any touristy places on her itinerary. She always prefers the road less traveled and her favorite place to be is on the water.